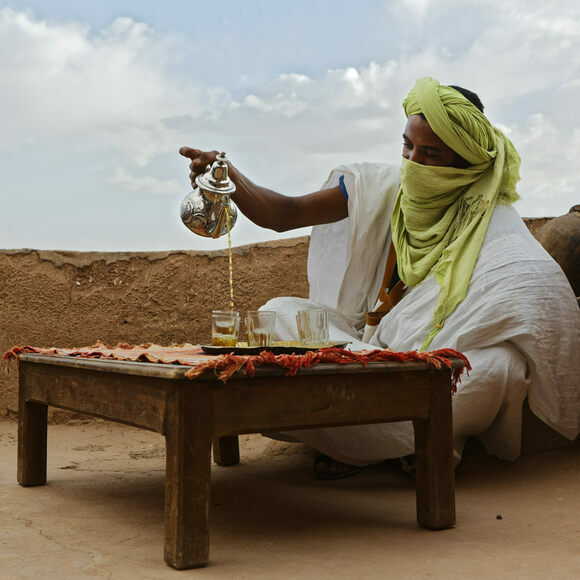 Hot or cold, day or night, the acts of preparing and sharing sweet mint tea are “daily rituals of generosity and exchange” in Morocco, and a sign of welcome to any guest. While preparing the tea can be sacred and private, presenting and pouring is a time-honored performance. While preparations vary, most recipes for Moroccan mint tea involve gunpowder green tea, sugar, and fresh mint. The brew requires only a short stint boiling over the fire. When the tea is ready, it’s common for hosts to pour a few initial glasses, then dump the liquid back into the pot, thoroughly mixing the sugar and mint flavors. Then, it’s time for the formal pours. The flashiest hosts present their tea by beginning with the pot’s spout poised close to the tea glasses. As they pour, they increase the distance and arc of the stream outward in a continuous motion, returning the pot to the edge of the glass in a grand gesture. This display, meant to honor the guest, also serves to aerate the tea, adding froth and texture to its surface. A ritual that showcases the beauty of the present moment.